Moti Maya Lepcha, 88, officially a gardener without retirement, who nurtured Subash Chandra Bose's link with the hills throughout her life, breathed her last today. Family sources said Moti Maya had died of old age-related illness at the Kurseong subdivisional hospital around 11.30am today. "She was admitted to the hospital yesterday and she had been unwell since 2014. The funeral will take place tomorrow," said a family source. Moti Maya, used to call Netaji, "kaka babu" which loosely means uncle and is used to describe one's father's younger brother. A few years ago, she had told The Telegraph: "I used to call him kaka babu. My father Kalu Singh Lama used to work as a chowkidar for him. When my father was away for work and left us behind, Netaji used to take care of my family. He played with his nieces Mira, Gita, Roma and Chitra. I also gave them company." This was when Moti Maya was just nine and Netaji was put under house arrest at the home of his brother Sarat Chandra Bose at Giddeparhar, 3km from Kurseong, in 1937. Sarat Chandra had bought the house from one Rowley Lascelles Ward in 1922. Sarat Chandra, too, was interned at the house from 1935 to 1936. It was also widely believed that Netaji had written his speech that was delivered at the Haripura Congress meeting at the Giddeparhar home. The nine-year old was not just part of the extended Bose family but also one of the last surviving witnesses to those historic moments. 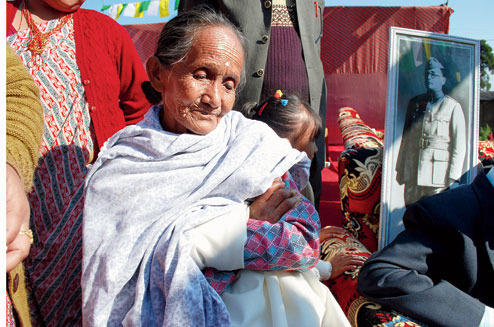 During the centenary birth celebration of Netaji in 1996, Moti Maya was felicitated across the hills. In Siliguri town, she was driven in a chariot. Moti Maya took care of the house throughout her life and on April 23, 2000 when the state government converted the house into Netaji Museum and Centre for Studies in Himalayan Languages, Society and Culture, she was appointed as a "gardener" by the state government. The state government had acquired the property in 1996 and placed it under the management of the Netaji Institute for Asian Study (NIAS), Calcutta. She has drawn a monthly salary of Rs 17,000 and stayed at the institute's quarter with her daughter, Pramila Lepcha. Moti Maya is survived by four daughters. Her husband died long time ago. Suranjan Das, director, NIAS, said over phone from Calcutta: "She was closely associated with the Bose family and the Independence movement. The institute will bear all cremation expenses. " When Bose's house was converted into a museum, Moti Maya had said: "This pictorial gallery will constantly remind me of Netaji. He was a great man and this museum will introduce the man to the younger generation."